Devoted readers and astute clinicians know of the importance of the isthmus. I found this definition for isthmus online on dictionary.com: a connecting, usually narrow, part, organ, or passage, especially when joining structures or cavities larger than itself. In the case of canal anatomy, we're referring to a narrow band of tissue connecting two canals. 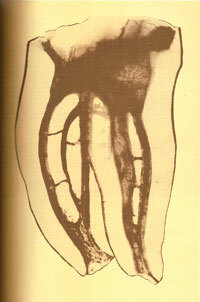 These isthmus areas can occur in any tooth with multiple canals, and can be seen all the way back in the images published by Hess in 1925. Recently, researchers are using micro-ct imaging to have a more accurate map of the anatomy. The next image is from http://rootcanalanatomy.blogspot.com/, a great resource for understanding canal anatomy. We can see the red color representing the preparation of the canals by rotary files, and the green area of unprepared canal space in the isthmus areas. It is evident from this image that our rotary instrumentation alone does not address but a small percentage of the canal anatomy. I prefer the 3 or 4. Clinically, I have experience using many of the techniques described in Gu's article, and, after using passive ultrasonic agitation for years, I have recently switched to the Endoactivator's sonic agitation. I am not convinced whether one technique is strictly superior to another, but I highly recommend you use some form of advanced irrigation in your practice, especially in necrotic cases. These retreatment images by Dr. Stephen Parente show debris and necrotic tissue within the coronal third of the canal isthmus of a mandibular first molar. The original root canal treatment was performed outside of our practice several years ago by a different dentist. An ultrasonic tip described above was used to clean the area. Preop. There was some concern of finding a vertical root fracture, but there was no detectable attachment loss. Mesial isthmus exposed full of debris. Cleaned of all debris using an ultrasonic tip. No fractures evident. With the previously described limitations to our cleaning of the canal isthmus, we may conclude that we are occasionally "entombing" some bacteria or necrotic tissue within the isthmus area with our obturation materials. In those cases where bacteria persist through all our advanced cleaning and find a portal of exit, we must rely on a different approach to resolve apical inflammation and infection. These next images, captured from a recent mandibular molar apicoectomy of mine, demonstrate an unclean isthmus from the apical view. 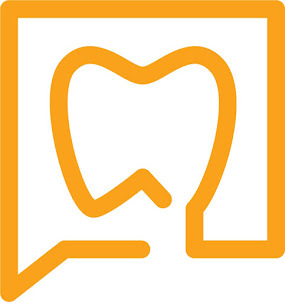 The original root canal treatment was performed outside of our practice several years ago by a different dentist. Preop 1. Apical radiolucency on mesial root. Upon root resection, we see a stained black isthmus area between the canals. 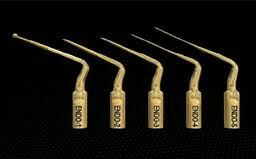 A contra-angled surgical ultrasonic tip was used for the retroprep and to clean the isthmus area. MTA was used for the retrofill. These two case images illustrate approaches to correct unclean isthmus areas that can contribute to treatment failure. With good magnifcation, and with advanced irrigation, we can clean the isthmus and avoid having to recommend retreatment or apicoectomy procedures. If you have any questions or comments, please let us know. As always, more cases and thoughts on endodontics can continually be found on our practice's facebook page, www.facebook.com/alpharettaendo. Thanks to Dr. Stephen Parente for supplying the retreatment images. 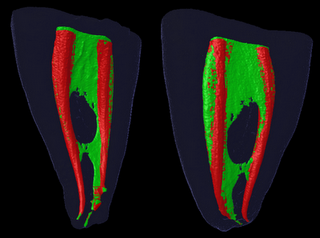 Thanks to The Root Canal Anatomy Project for supplying the micro-ct image. Gu L, Kim J, Ling J, Choi K, Pashley DH, Tay FR. Review of Contemporary Irrigant Agitation Techniques and Devices. J Endod 2009; 35: 791-804. Gutarts R, Nusstein J, Reader A, Beck M. In vivo debridement efﬁcacy of ultrasonic irrigation following hand-rotary instrumentation in human mandibular molars. J Endod 2005;31:166–70. Susin L, Liu Y, Yoon JC, Parente JM, Loushine RJ, Ricucci D, Bryan T, Weller RN, Pashley DH, Tay FR. Canal and isthmus debridement efficacies of two irrigant agitation techniques in a closed system. Int Endod J 2010; 43: 1077-90.